Halloween | Letters from Gondwana. H.P. Lovecraft’s love for astronomy is well known. As an amateur astronomer, Lovecraft attended several lectures from leading astronomers and physicists of his time. 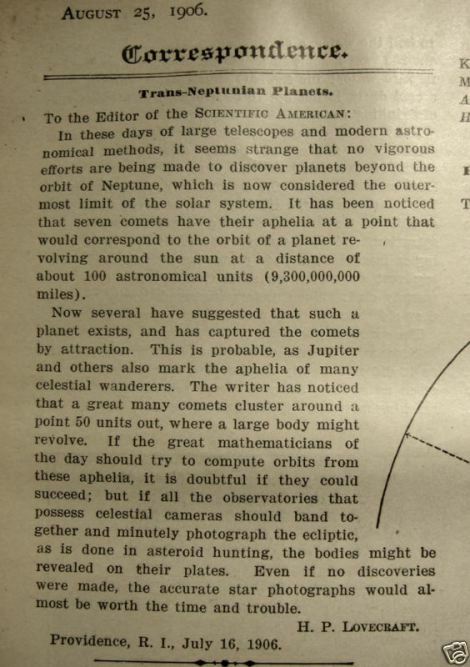 In 1906 he wrote a letter to the Scientific American on the subject of finding planets in the solar system beyond Neptune. Around this time he began to write two astronomy columns for the Pawtuket Valley Gleaner and the Providence Tribune. He also wrote a treatise, A Brief Course in Astronomy – Descriptive, Practical, and Observational; for Beginners and General Readers. In several of his astronomical articles he describes meteors as “the only celestial bodies which may be actually touched by human hands”. But Lovecraft was also obsessed with the concept of deep time, so geology and paleontology were also present in his writings. According to his biographer S. T. Joshi, Lovecraft was fascinated by Antarctica since an early age. Much of this fascination is recognizable in his famous novel “At the Mountains of Madness”, written in 1931. 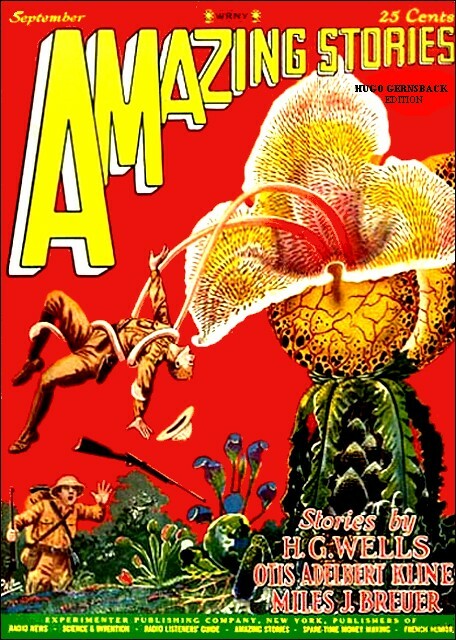 The novel was rejected by Weird Tales and finally was published by Astounding Stories in a serial form in 1936. “At the Mountains of Madness” is told from the perspective of William Dyer, a geologist from Miskatonic University who flies into an unexplored region of Antarctica. He’s accompanied by Professor Lake, a biologist, Professor Pabodie, an engineer, and some graduate students. The basic plot of the novel is the discovery of the frozen remains of bizarre entities from the deep space and their even more terrifying “slaves”: the shoggoths. The story could be divided in two parts. The first one is particularly rich, detailed and shows an impressive scientific erudition. This is clear in the following paragraph when he describes something that Professor Lake found: “He was strangely convinced that the marking was the print of some bulky, unknown, and radically unclassifiable organism of considerably advanced evolution, notwithstanding that the rock which bore it was of so vastly ancient a date—Cambrian if not actually pre-Cambrian— as to preclude the probable existence not only of all highly evolved life, but of any life at all above the unicellular or at most the trilobite stage. These fragments, with their odd marking, must have been 500 million to a thousand million years old”. Of course, one of the most fascinating parts of the novel is the description of the Elder Things: “Cannot yet assign positively to animal or vegetable kingdom, but odds now favour animal. Probably represents incredibly advanced evolution of radiata without loss of certain primitive features. Echinoderm resemblances unmistakable despite local contradictory evidences. Wing structure puzzles in view of probable marine habitat, but may have use in water navigation. Symmetry is curiously vegetable-like, suggesting vegetable’s essentially up-and-down structure rather than animal’s fore-and-aft structure. Fabulously early date of evolution, preceding even simplest Archaean protozoa hitherto known, baffles all conjecture as to origin.” According with S.T. Joshi, Lovecraft based his description of the Elder Thing in the fossil crinoids drawn by E. Haeckel in Kunstformen der Natur. Tunguska forest (Photograph taken by Evgeny Krinov near the Hushmo river, 1929). “The Colour Out of Space” is a short story written by H. P. Lovecraft in 1927. The story is set in the fictional town of Arkham, Massachusetts, where an unnamed narrator investigates a local area known as the “blasted heath”. Ammi Pierce, a local man, relates him the tragic story of a man named Nahum Gardner and how his life crumbled when a great rock fell out of the sky onto his farm. Within the meteorite there was a coloured globule impossible to describe that infected Gardner’s family, and spread across the property, killing all living things. It’s the first of Lovecraft’s major tales that combines horror and science fiction. The key question of the story of course is the meteorite. Although “the coloured globule” inside the meteorite has mutagenic properties we cannot define their nature. But as Lovecraft stated once, the things we fear most are those that we are unable to picture. “The Colour Out of Space” was published nineteen year after the Tunguska Event. On the morning of June 30, 1908, eyewitnesses reported a large fireball crossing the sky above Tunguska in Siberia. The object entered Earth’s atmosphere traveling at a speed of about 33,500 miles per hour and released the energy equal to 185 Hiroshima bombs. The night skies glowed and the resulting seismic shockwave was registered with sensitive barometers as far away as England. In 1921, Leonid Kulik, the chief curator for the meteorite collection of the St. Petersburg museum led an expedition to Tunguska, but failed in the attempt to reach the area of the blast. Later, in 1927, a new expedition, again led by Kulik, discovered the huge area of leveled forest that marked the place of the Tunguska “meteorite” fall. At the time, Kulik mistook shallow depressions called thermokarst holes for many meteorites craters. However, he didn’t find remnants of the meteorite, and continued to explore the area until World War II. In the early 1930s, British astronomer Francis Whipple suggested that the Tunguska Event was caused by the core of a small comet, while Vladimir Vernadsky, suggested the cause was a lump of cosmic matter. (Rubtsov, 2009). 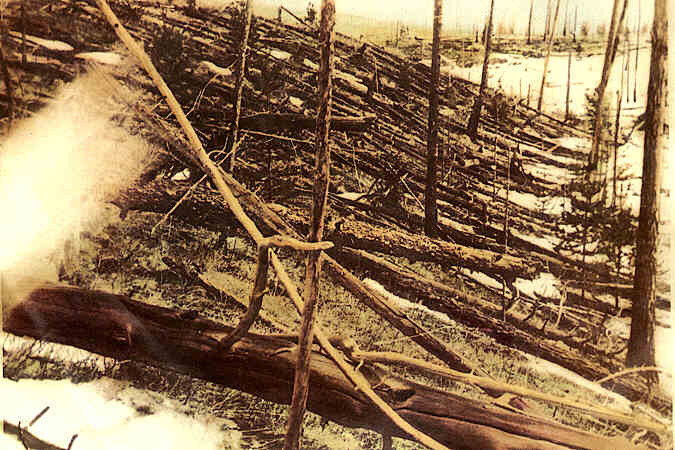 More than a century later the cause of the Tunguska Event remains a mystery. Lovecraft, H. P, “At the Mountains of Madness”, Random House, 2005. Lovecraft, H. P, “The Dreams in the Witch House and Other Weird Stories”, Penguin Books, 2004. Halloween special IV: Atlach-Nacha and the Spiders of Leng. Clark Ashton Smith (January 13, 1893 – August 14, 1961) was an American poet, sculptor, painter and author of fantasy, horror and science fiction short stories. He was one of the big three of Weird Tales, with Robert E. Howard and H. P. Lovecraft. His work is marked by an extraordinarily rich and ornate vocabulary, a cosmic perspective and a sardonic humor. Among his numerous contribution to the Cthulhu Mythos is Atlach-Nacha, the spider God, first introduced in “The Seven Geases” (Weird Tales, Vol. 24, No. 4, October 1934). Atlach-Nacha resembles a huge spider with an almost-human face. It dwells within a huge cavern deep beneath Mount Voormithadreth, a mountain in the now vanished kingdom of Hyperborea in the Arctic. The bloated purple spiders of Leng are thought to be its children and servitors. From Greek mythology to African folklore, the spider has been used to represent a variety of things, and gained a reputation for causing irrational fear in humans. Among the oldest known land arthropods are Trigonotarbids, an extinct order of terrestrial arachnids related to modern day spiders. The earliest trigonotarbid known in the fossil record is from the Silurian Ludlow Bone Bed. In 1923, Stanley Hirst described five species of trigonotarbids from the Rhynie cherts under the generic names Palaeocharinoides and Palaeocharinus. These are Palaeocharinoides hornei, Palaeocharinus rhyniensis, P. scourfieldi, P.calmani and P. kidstoni. Spiders (Order Araneae) are massively abundant generalist arthropod predators that are found in nearly every ecosystem on the planet since the Devonian (>380 mya). The oldest true spiders belonged to the Mesothelae. Mongolarachne jurassica, from Daohuogo, Inner Mongolia in China, is the largest known fossil spider. Mongolarachne is remarkable for being larger than its female counterpart, Nephila jurassica, found on the same site in 2011. HALLOWEEN SPECIAL III: Lovecraft, The Tunguska Event and The Colour Out of Space. H.P. Lovecraft’s love for astronomy is well known. As an amateur astronomer, Lovecraft attended several lectures from leading astronomers and physicists of his time. In 1906 he wrote a letter to the Scientific American on the subject of finding planets in the solar system beyond Neptune. Around this time he began to write two astronomy columns for the Pawtuket Valley Gleaner and the Providence Tribune. He also wrote a treatise, A Brief Course in Astronomy – Descriptive, Practical, and Observational; for Beginners and General Readers. In several of his astronomical articles he describes meteors as “the only celestial bodies which may be actually touched by human hands”. The cover of “The Colour Out of Space” by Frank R. Paul, Amazing Stories, September 1927. The enigmatic nature of the Tunguska Event inspired several fictional works. In the novel “Extinction Event”, a spin-off book for the science fiction series Primeval, the Tunguska event opened a gargantuan anomaly that periodically opens every few decades. The anomaly is linked to the late Cretaceous, just before the Cretaceous–Paleogene extinction event. The Tunguska Event was also included in two episodes of The X-Files (“Tunguska” and “Terma”). The show suggested that the incident was caused by an asteroid impact. In the plot, Fox Mulder and Alex Krycek traveled to the site of the impact, and discovered a military installation where Russian scientists study the black oil found inside the rock, which contained a microbial form of alien life capable of possessing a human body. In the episode “Piper Maru”, the same alien organism infected Krycek. After 107 years, the Tunguska Event is still a mystery. Recently it was suggested that the Lake Cheko, a 300-m-wide lake situated a few kilometres from the assumed epicentre of the 1908 Tunguska event, is an impact crater, but several lines of observational evidence contradict the hypothesis. Lovecraft, Howard P. (1927). “The Colour Out of Space”.